Do you want to make a watermelon carving that is more impressive than your mother's ordinary watermelon basket? If so, you have certainly come to the right place! Sign in on the right to get a complete free lesson showing how to make an easy, yet impressive watermelon bowl. you’ll be hearing oooohhs and aaaaahhs very soon. Make sure to scroll down this page and look at the more than 60 photos of watermelon carvings that are bound to give you some inspiration and ideas for carving your own watermelons. My first watermelon carving was a simple cake shaped watermelon that I made to celebrate my sister-in-law’s birthday. My desire to make a non-cake cake is what started me into learning fruit and melon carving. If you want to know more about that story click here. Even with my first, less than perfect carvings, I received lots of oooohs, aaaaaahs. At the time, I didn’t really know much about watermelon carving. I had seen the usual watermelon basket fruit salads at picnics and a few cute but rough watermelon creations on a cruise ship but that was about all. Once I started looking into it further, I discovered a whole amazing world of watermelon carving. The Beauty of Watermelon Carving. It can be much easier than you think – when you are shown how. From making my very first watermelon carving, I have fallen in love with this art. It is so gratifying to take an ordinary watermelon and transform it into an amazing work of art. At first I thought it would be so difficult. But, once I was shown how by my teacher, I saw that it was really just a process of repeating a few simple techniques to carve elaborate looking watermelon creations. I discovered that it is much easier than I thought! When teaching other how to carve through my video lessons, I’ve often received the same kind of comments from them. I am truly enjoying my lessons. I have carved two roses on a honeydew melon. I was intimidated to try the honeydew flowers, but I dug in and was pleasingly surprised by the results. I also did the beet and turnip roses. I look forward to making my first watermelon carving cake. Thank you for the videos that made all this possible. You made it so easy for me to carve the turnips and beets flowers. Before your video I thought it was impossible for me to do the flowers, but with your video I was able to do few of them. Once you know some of the basics, the process of carving watermelons is so enjoyable. It’s almost like a meditation. While focused on carving, the rest of the cares of the world drop away and time seem to stand still. When my watermelon carvings are complete, I love being able to stand back, look at it and say to myself, WOW, look what I made. Then the oooohs and aaaaahs and compliments over my carvings are like the icing on the cake. Even with my first less than perfect carvings, I received lots of oooohs and aaaaaahs. You will, too. You’ll see. It’s lots of fun. I just love how watermelons have all the layers of colors to work with starting with the green rind that leads into the pale green, then white of the inner rind to the lighter pinkish red of the fruit than often gets to be a deeper red as in gets deeper into the fruit of the watermelon. When creating a watermelon carving, you can carve beautiful red flowers with white tipped petals. You can leave thin edges of green rind to make green tipped leaves or petals. You can leave large surfaces of green rind and carve designs and logos revealing the white part of the rind for contrast. Or you can do the reverse leaving green letters and designs that contrast against the white inner rind. 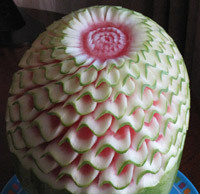 The art of watermelon carving is an varied as there are people who carve watermelons, limited only by imagination. While writing this I realize that talking about watermelon carving is like trying to describe a sunset. Words just don’t do justice to the actual beauty of it. So here are some photos…. Pictures are a great way to get some inspiring ideas. 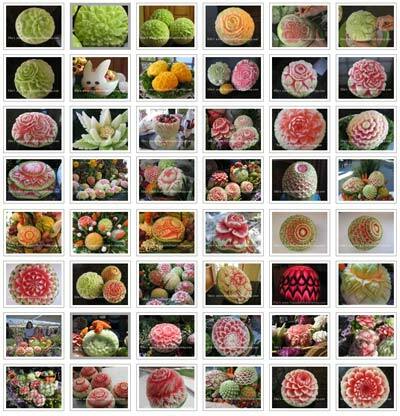 So, I’ve got over 60 watermelon carving photos that will give you some ideas of melon carvings that you can do. If you already have a lot of carving skills, these photos will give you some good ideas. 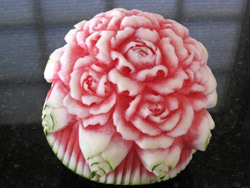 If you are new to fruit & vegetable carving, these photos will give you an idea of some of the carvings that can be done. Many are easier to do than they look at first glance, when you are shown how. There are so many ways to carve watermelons. Besides your ordinary watermelon basket, melons can be carved into all sorts of beautiful flowers, swans, and decorative serving bowls, vases for fruit flower displays and much much more. With a variety of carving techniques, the possibilities are endless. 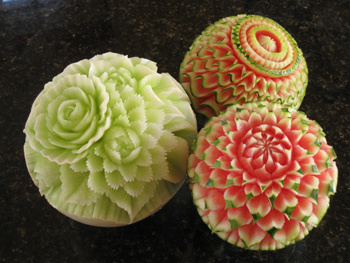 There are also endless ways that watermelon carvings can be displayed. They can serve as a fruit salad bowl at a simple outdoor barbecue, they can serve as a centerpiece for a dining or buffet table, or they can can be combined with other melon carvings, fruit and vegetable carvings and fresh greens and flowers to make elaborate displays for weddings or other special events. These photos are bound to give you some ideas. Trying to learn watermelon carving through words and photos is nothing compared to the effectiveness of being shown how. How to position melon to make it comfortable for you while carving while giving you the maximum carving control. How to use the knife while carving. Which knives are best to use to get the best results. How to store your watermelons so that they look fresh when you are ready to display them. How long you can expect your watermelon carvings to last. How to start the center of a flower. How to fix mistakes that you may make while carving. How to cut the proper angles so that the pieces that you want to remove to reveal a beautiful 3 dimensional pattern, come out easily. How to finish your edges to create a completed look for your watermelon carving. These are all things that I learned from my teachers. And, this is some of what I teach in my Watermelon Carving video lessons. When I show you how, you may be surprised to learn that carving is easier than you may think. My next set of melon carving lessons pick up where Carving Watermelons leaves off. 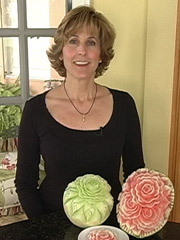 In my lessons Carving Melon Flowers – Smooth and Jagged Petals you will learn a more intermediate carving patterns that will WOW your friends and family. 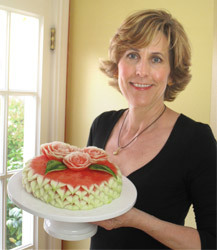 Or you might want to learn more about carving some really beautiful watermelon cakes. Not only are they impressive and unexpected, they make a healthy alternative to regular cake for loved ones who are on restricted diets. Watermelon cakes are gluten free, and free of processed white flour, refined sugar, eggs, butter and other highly saturated fats and are free of artificial flavors and preservatives. Watermelon cakes are simply clean refreshing and natural – great for people with food allergies, high cholesterol, vegans, some diabetics and for people who simply prefer to eat healthy. You can learn more about making Watermelon Cakes here. Many times you will peel your watermelon before carving. You can peel your watermelon with a large sharp knife. But, here is a mini-lesson showing a quick way to peel a watermelon. click the button below and sign in.